This book offers a new understanding of innovation in the built environment. The ways meaning of innovation is constructed has important implications for policymakers, project managers, academics and students. 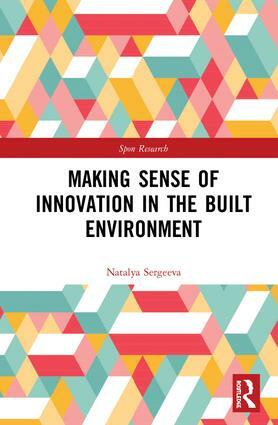 Through a longitudinal research study into innovation in firms and projects, the book addresses some key themes, challenges and concerns that practitioners face when managing innovation in the built environment. It examines the key drivers for innovation in the construction, engineering and infrastructure firms and projects. In particular, the questions of how and why innovation becomes recognised and sustained over time are explored. Different theoretical perspectives are considered to explain different aspects of innovation. This includes sensemaking, organisational and individual identity, storytelling and narration. The book has practical implications for how organisational activities become labelled as ‘innovation’ and for what purpose. It shares some lived stories of innovation as mobilised by practising managers. The connectivity between the formal narratives of innovation at the policy level and the lived narratives of innovation articulated by practitioners is explored. Combining the theory with practice, this book presents an insightful view on the implications of innovation in the business world today. Chapter 1 What does innovation mean? Natalya Sergeeva is an Associate Professor in the Management of Projects at the Bartlett School of Construction and Project Management, University College London, UK.